Google announced new Chromecast 2 and Chormecast audio on September 29, 2015. The second generation Chromecast, which is a $35 dongle that plugs into any HDMI screen to make video playback more convenient and intelligent, is on its way to conquer the new enjoyment of TV shows, movies, music, sports, games and more on your TV. And in this article you can learn how to stream DVD to Chromecast 2 for watching DVD movies on HDTV even without downloading a DVD decoder or player. WinX DVD Ripper Platinum - Adept in fast converting any regular & encrypted DVDs to Chromecast (2/Ultra) accepted format like MP4 for later DVD movie streaming to HDTV via Chromecast (2/Ultra). Get Free License Key Unconditionally! • Chromecast 2 new features: In an all new design, it is round shaped in three different colors, Lemonade, Coral and Black. Chromecast 2 has an upgraded onboard Wi-Fi module (2.4GHz/5GHz 802.11ac). Rumor has it that it supports higher-resolution (even 4K) streaming. However, this feature isn't achieved on this iteration, and available on Chromecast Ultra. Similar to the first generation, it features 512MB memory, 1080p display and HDMI Micro-USB port. The bigger question is whether H.264 video decoding is still limited to 1080p30, or if 1080p60 is finally supported. Chromecast 2 has a great function of streaming local videos. And with a DVD to Chromecast converter, you can stream DVD from PC/Mac to HDTV via Chromecast 2 easily. How to Stream DVDs to Chromecast 2 from PC/Mac? Chromecast is available to cast local files with Google Cast browser extension, but not include DVDs. So does Chromecast 2. If you want to cast a DVD to TV via Chromecast 2, you need a DVD converter to convert DVDs to Chromecast supported file formats like MP4 and WebM firstly. Step 1. Download and install a DVD converter. When it comes to DVD converter, WinX DVD Ripper Platinum is second to none. It is able to rip and convert any DVDs including latest copy-protected DVD discs/DVD folders/ISO files (disney 99-title DVDs, workout DVDs and Japan AV DVDs are supported as well) to MP4, WebM, AVI, MOV, 3GP, M4V, and others. It is the strongest for 99-title DVDs and always the 1st to support new DVDs. Most notably, it has a ready-made output profile for Chromecast, thus you can directly rip DVD to Chromecast 2 without complicated settings. Thanks to hardware acceleration technology and other cutting-edge techniques, it can rip DVD to Chromecast 2 supported format in a matter of minutes. Note that the speed varies with your computer configuration. It is available to stream DVD to Chromecast 2 on Windows XP, Vista, 7, 8, and 10, etc, as well as Mac OS X 10.6 or later, including macOS High Sierra. Step 2. Launch DVD to Chromecast 2 ripper and load DVD. After downloading and installing WinX DVD Ripper on your PC or Mac, you can launch it and click "DVD Disc" button to load the DVD you want to play on HDTV via Chromecast 2. Step 3. Choose "Chromecast MP4 Video (H264)" as the output. Seconds later, this software will select the DVD main title and display the Output Profile window for you spontaneously. 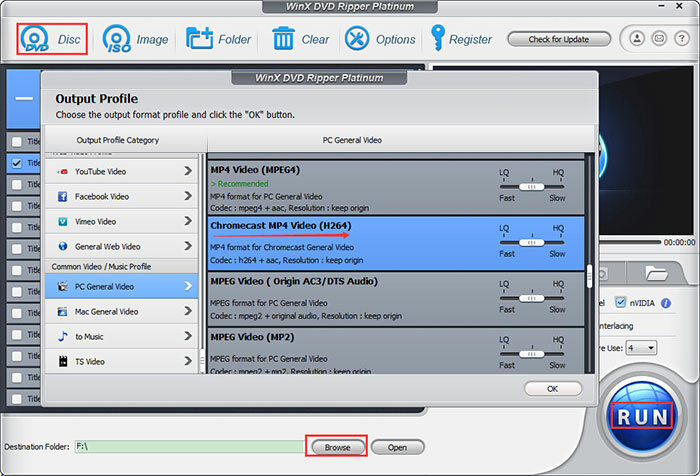 To stream DVD to Chromecast, a profile named "Chromecast MP4 Video (H264)" under PC General Video category is your best output option. Click on it and hit "Ok" to go on. Step 4. Specify a destination folder and begin ripping DVD to Chromecast 2. Click "Browse" to choose a destination folder to store the ripped DVD content. Then tap on "RUN" button to begin ripping DVD to Chromecast 2. Step 5. Stream DVD movie to Chromecast 2. 1. Add Google Cast extension to your Chrome browser (if you haven't done it). You can get this extension from chrome web store. After successful installation, you can set "Tab casting quality" in "Option" based on your own needs. 2. Type the video file address like "file://d:/hobbit 3.mp4" (without quotation marks) to the address bar in Chrome. 3. Stream DVD to Chromecast 2. If you need to fast transfer hot movie video to iPhone X/8/7/SE/6s, iPad Pro/Air 2/mini 4 etc. after DVD ripping without using iTunes, please try WinX MediaTrans. This is a step-by-step guide to rip DVD to Chromecast(2), stream DVD movies to Google Chromecast HDMI Dongle, and cast DVD videos from PC/Mac to TV via Chromecast. Want to stream DVD to Roku? This article will show you how to rip and stream DVD movies to Roku supported formats for playing on HD TV. Part 2How to Stream DVDs to Chromecast 2 from PC/Mac? Part 3What's More about WinX DVD Ripper Platinum?